﻿ How does it works? Home » How does it works? 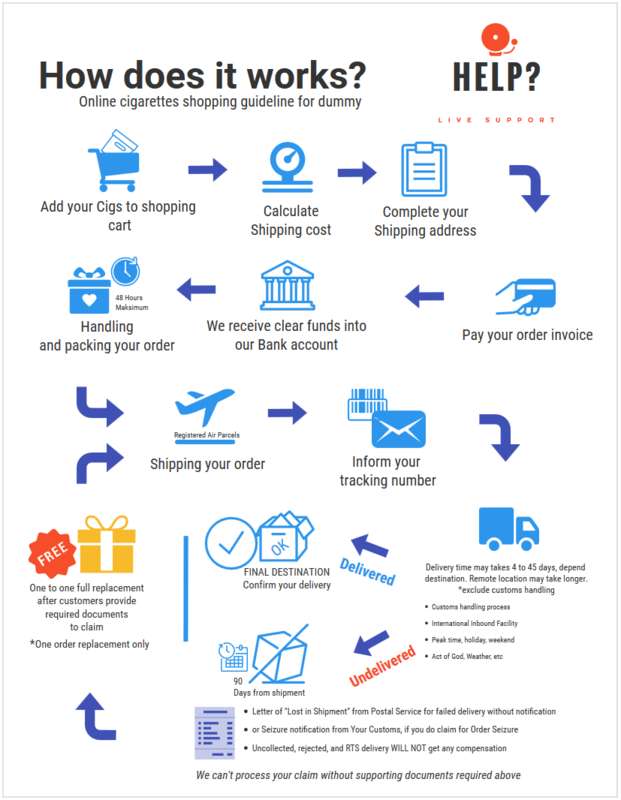 How to buy cigarettes online? Simple guides for dummy. Help you understand how we works. Some postal area or states, require to collect inbound international parcels at your local Post office. They required your sign and might pay some small ammount inbound handling fees. Make sure you input correct and active phone number, to get immediate notification from your postal service about your parcels collection. Parcels may expired if you don’t collect them for 30 days. And automatically returned to Sender. We do not offer any replacements or refunds for this kind of mistakes. All returned parcels belongs to CigaretKretek.com and you dont have ant right to claim it. Every returned parcles always had stamp “return reason” from your local postal office. Seizure of parcels will be happened if recipient do not comply Customs request to pay Excise duty for tobacco and or any GST. Being good part, and good negoisator is the key on this situation. This kind or rejection, is common when Customs decide to open your gift parcels. And found there was “prohibited items” regarding law and regulation on your state or country to inbound. Customs will give it back to Postal service to returned to Sender without any additional charge. You egible for replacement as long your order not more than 10 Packs. We will process your order after it arrived into our warehouse. Recipient will be notified by Phone or Mail to collect their inbuund parcels at nearest Post Office or Customs Office after they found the “prohibited items” inside your parcels. And, recipent refuse to pay Excise duty and GST applied. Customs will give parcels back to Postal Service and recipeint may pay return shipping cost. This kind of reject will not get any kind of Compensation and or any kind of replacement parcels. And mostly, recipient address will be flagged for next Inbound international shipment. This kind of Rejection is very rare. Sometimes it happend when recipients living in Appartment or shipping address to Workplace. Where mostly postman will deliver parcels to Lobby. When the recipients are not in place, or travelling abroad, Lobby will refuse to receive your parcels. It will be attempt of delivery several times by your local postal service. Them it will be marked as “Rejected by recipients”. You still eligible to claim your order to be reship with pay extra handling cost and shipping cost to your new address. We will process your order after it arrived into our warehouse. Sometimes postal service handling ignore the warning label attached on the parcels packaging. Or, someone try to steal your parcels contains. If you receive damaged parcels, you may reject it. You should take a photograph for the damaged parcels, and you get letter of rejection from postal office to claim your shipping cost and valued insured goods.